The image above is the title page of Goldfaden's comedy Shmendrik (Warsaw,1890). Shmendrik was adapted from the popular Romanian comedy Vluadutsu Mamu, and influenced by several early Russian comedies such as Denis Fonvizin’s Nedorsol (1782). The play follows the story of a Jewish mother of good socioeconomic standing, desperate to marry her foolish son Shmendrik to Rivke, a beautiful, intelligent young woman. Rivke's father, who has fallen on hard times, accepts the proposed arranged marriage, to the dismay of his daughter. Rivke is rescued by her true love, who hatches a plan to marry her himself. Shmendrik and his family represent the “old way” of love and marriage based on Jewish tradition and lineage. 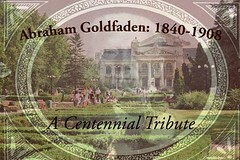 Through the near disaster of Shmendrik and Rivke's union, Goldfaden displays his penchant towards modern or maskilic (Jewish enlightenment) values. Shmendrik was one of the first Yiddish plays performed in New York in 1885. Source: Yiddish Drama Collection at the Jewish National and University Library.